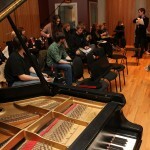 Tucked against a wall of Studio A in The College of Saint Rose communications building, where music industry students took a final exam on Tuesday, a slice of American jazz history beckons. Written in a flowing, cursive hand, the name “Dave Brubeck” is sheltered beneath the lid of the gleaming Mason & Hamlin grand piano. “1971,” it is labeled. Informed of this, a pair of students rose to examine the signature, written in black ink against the gold harp of the beloved instrument. A few said they hoped the karma of Brubeck, who died last week at 91, would rub off. 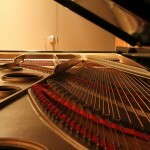 One said it was a brilliant piano to play, with a particularly rich sound. 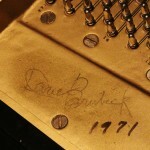 Brubeck’s inky signature, which appears above highest keys, might be compared to a handwritten musical score. The writing is soft and sweeping and large. The occasion of his signing the piano speaks to an earlier era, in his own career and that of the College. He was famous then, to be sure, maestro of the quartet behind “Take Five” and an innovator of polytonality. But the Albany appearance was still decades before the Library of Congress designated him a Living Legend,he had his own star on the Hollywood Walk of Fame and was included among the Kennedy Center honorees. And for the College of Saint Rose, the occasion marked a welcome celebration of the Mason & Hamlin, its second-ever concert grand. “He autographed it during a concert to dedicate the piano when it was first purchased,” said Sister Mary Anne Nelson, coordinator of the music industry program, who came to Saint Rose in 1983. 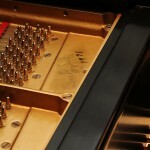 “We were a tiny department and getting a piano would have been a major, major undertaking. I imagine it involved a fundraising campaign. Dedicating it would have been as big as dedicating a new gym.”That event took place in Saint Joe’s Hall, the venue on the campus. Thirty-eight years later, in 2009, Brubeck would return to perform a concert at the new Massry Center for the Arts that reviewers called spirited and passionate and high energy. He was 88. He did not play on the Mason & Hamlin at that event because by then Sister Mary Anne had seen that it was moved into the even newer William Randolph Hearst Center for Interactive Media, where music industry students use it for recording. 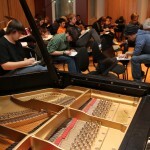 The College, of course, has acquired many fine pianos since then and no longer holds concerts for them. But the Mason & Hamlin remains her favorite. 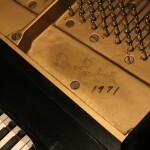 And when it was restored to accommodate the new building, she saw that care was taken to preserve Brubeck’s signature.